This gallery describes the highs and lows of the county's camogie, football and hurling teams. It includes the jerseys and football boots belonging to P.J. 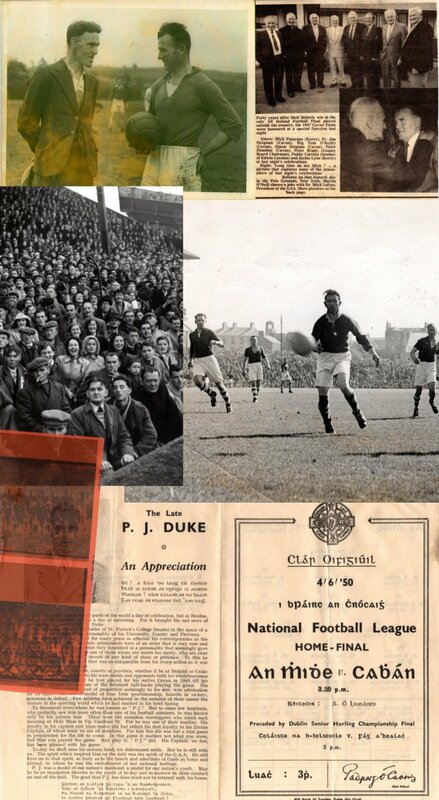 Duke, a Cavan footballer from the 1940s, as well as All-Ireland medals won by Cavan stars Val Gannon and Victor Sherlock. There is also a 500 year old sliotar made from hair on display, demonstrating the antiquity of our national games. The first GAA club in Cavan and Ulster as a whole was formed in Ballyconnell in late 1885. The club was called Ballyconnell Joe Biggars' in honour of West Cavan M.P. Joe Biggars. Other GAA clubs were formed shortly afterwards in other parishes, with some claiming to be the first GAA units in the county. As a result, Ballyconnell moved quickly to establish their proud record. They changed their name from Joe Biggars to First Ulster's and the club rightly claims its place in GAA history as the Cavan senior teams remained strong in Ulster, winning Ulster Finals in 1905, 06, 08, 15, 18, 19, 20. However, the gap between Ulster and the other provinces was great, and Cavan suffered heavy defeats in a number of All-Ireland Semi-Finals. The emergence of Jim Smith from Killinkere helped to bring Cavan to prominence in the 1920s. Cavan won six Ulster titles during this period, and their showing improved enormously in the semi-finals. Cavan won the Junior All-Ireland title in 1927, beating Kildare 0-7 to 1-3. Cavan's improvement continued and they reached the Senior All-Ireland. After many years of trying, Cavan's breakthrough eventually came in 1933 when, captained by Jim Smith, they won the Senior All-Ireland title for the first time. A golden era of Cavan football had begun and further senior titles came in 1935, 1947, 1948 and 1952, most famously in 1947, when Cavan defeated Kerry in the Polo Grounds in New York, the only time the All-Ireland Final has been played outside the country.